On May 27, 2015, Arctic sea ice extent was merely 11.973 million square kilometers, a record low for the time of the year since satellite started measurements in 1979. 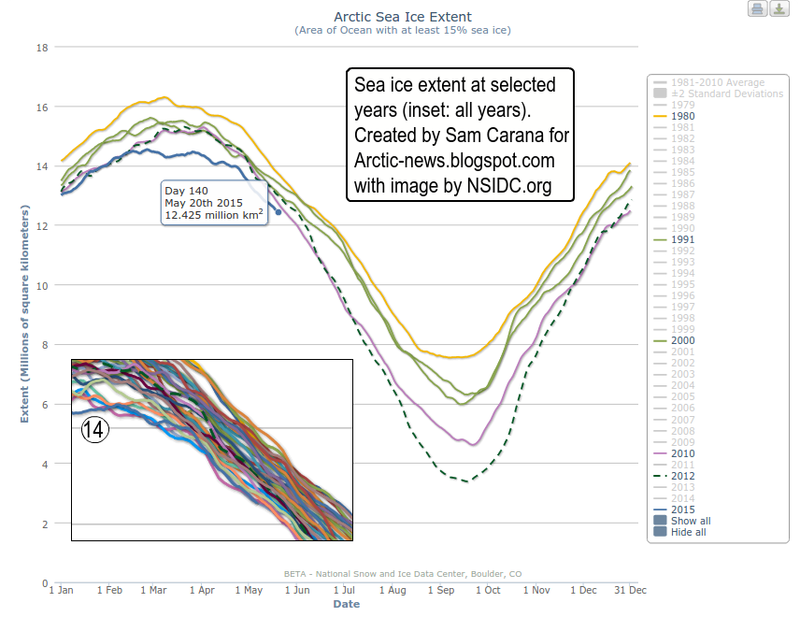 This fall in sea ice extent follows heat waves in Alaska and the north of Canada, as illustrated by the image below. 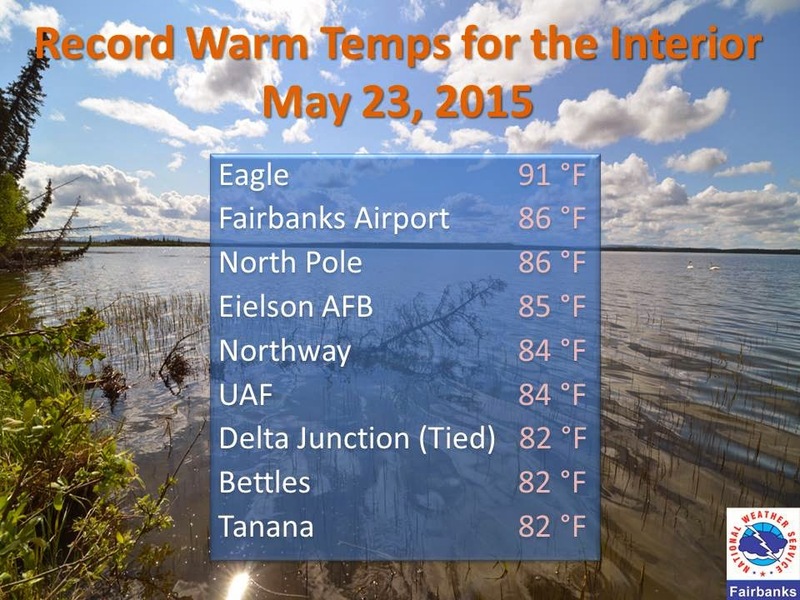 Temperature in Alaska on the afternoon of May 23, 2015, when a temperature of 91°F (32.78°C) was recorded in Eagle. High temperatures extended over the Beaufort Sea and Chukchi Sea. 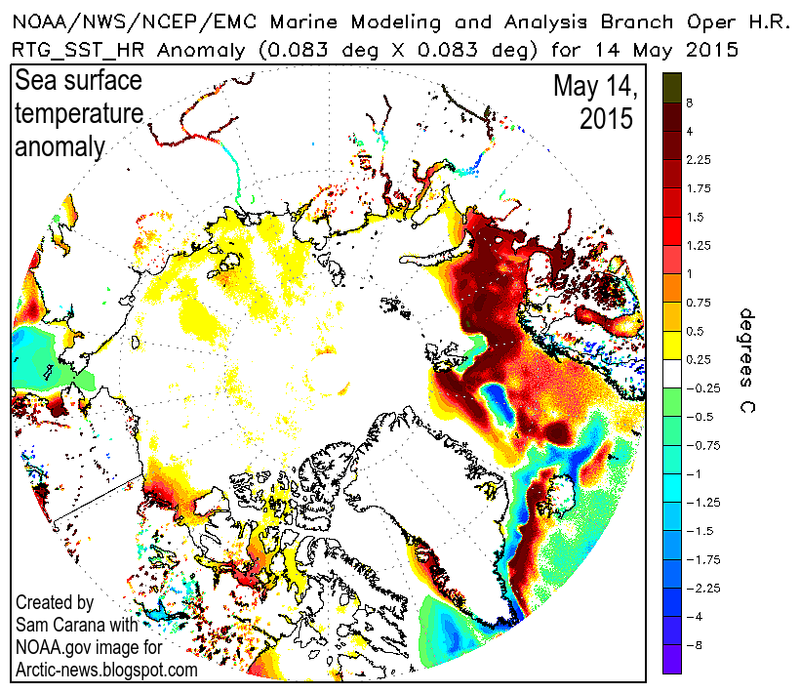 The image below shows the difference in sea surface temperatures between May 13, 2015, and May 23, 2015. 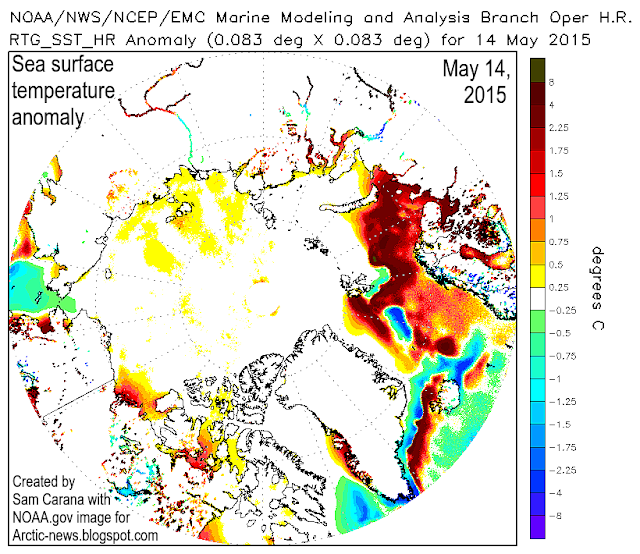 The large amounts of meltwater flowing into Beaufort Sea and the Chukchi Sea is illustrated by the image below, showing the difference in sea surface salinity between May 17, 2015, and May 24, 2015. Sea ice has retreated dramatically in the Chukchi Sea and the Beaufort Sea, and in Baffin Bay, with high sea surface temperature showing up where rivers flow into the Arctic Ocean and where the Gulf Stream carries warm water from the Atlantic Ocean into the Arctic Ocean. 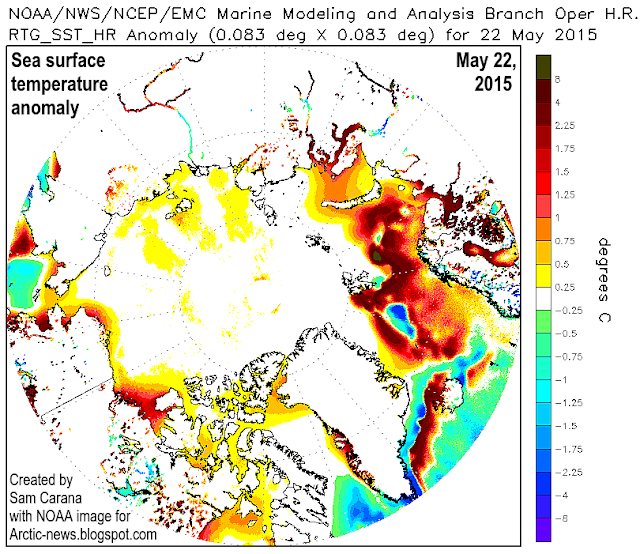 The size-reduced navy.mil animations below show the fall in sea surface salinity (left) and the fall in sea ice thickness (right) in the Beaufort Sea, from May 3, 2015, to June 2, 2015 (run May 27, 2015). 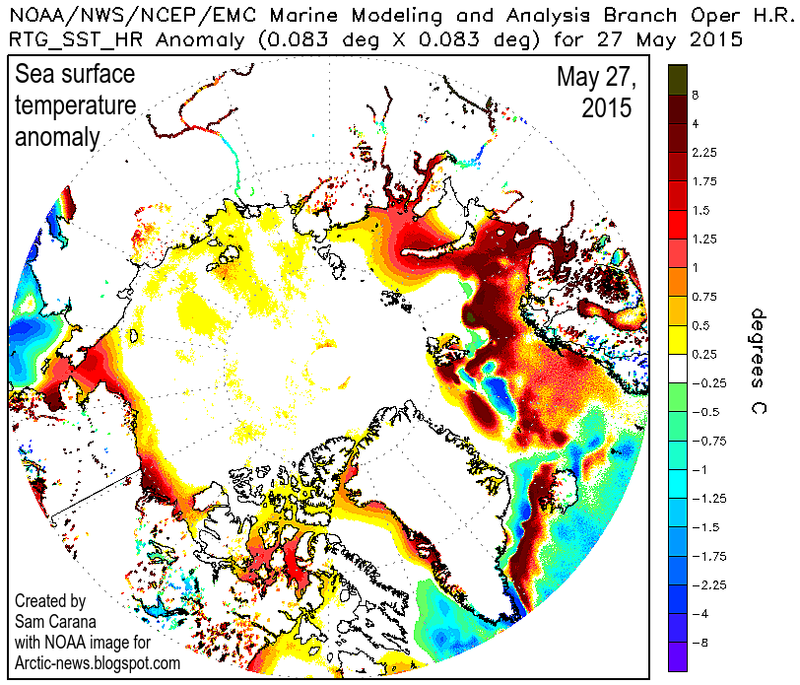 The image below shows sea surface temperature anomalies on May 27, 2015. 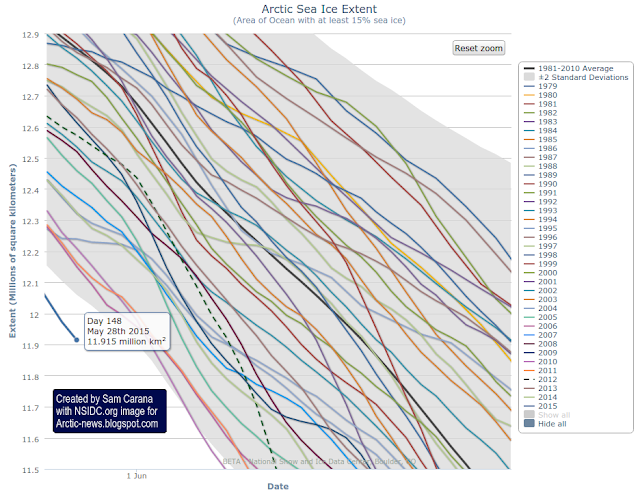 For reference, the animation below, from the Naval Research Laboratory, shows sea ice thickness over a 30-day period, including a forecast up to June 4, 2015. 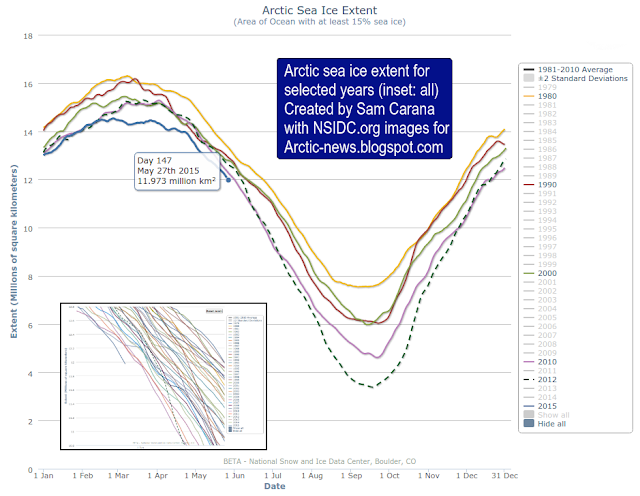 Update: here's an image showing Arctic sea ice extent up to May 28, 2015, highlighting that sea ice extent is now well outside 2 standard deviations. The situation is dire and calls for comprehensive and effective action as discussed at the Climate Plan. Huge amounts of carbon are contained in sediments, soils and vegetation in the Arctic. 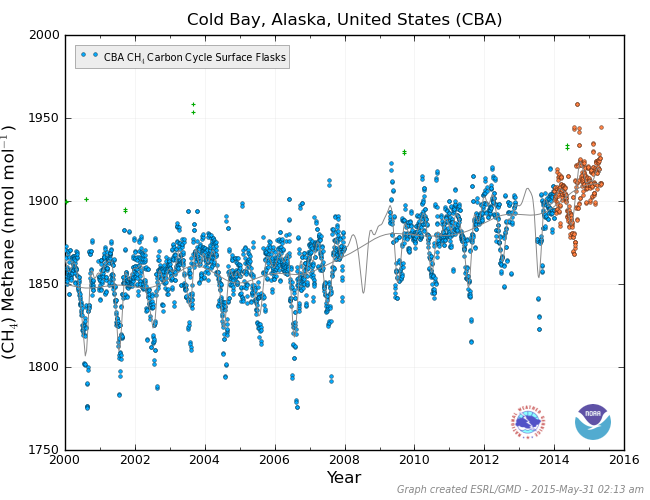 Rising temperatures in the Arctic threaten to cause much of this carbon to be released to the atmosphere. 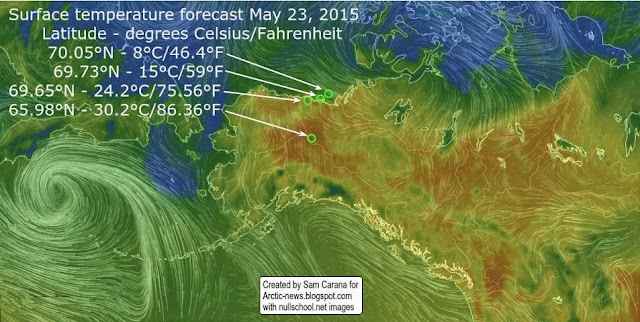 On May 23, 2015, temperatures in Alaska were as high as 91°F (32.78°C), as illustrated by the image below. High temperatures were reached at the city of Eagle, located on the southern bank of the Yukon River, at an elevation of 853 ft (260 m). High temperatures at such a location will cause meltwater, aggravating the situation well beyond the local area. Carbon contained in soils will thus become increasingly exposed under the combined impact of rising temperatures and the associated growing amounts of meltwater. 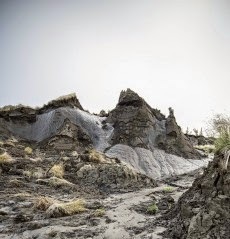 The meltwater can additionally cause erosion further downstream, thus making carbon at many locations become more prone to be consumed by microbes and released into the atmosphere in the form of carbon dioxide and methane. A recent study found that, at a location where the Kolyma river in Siberia carved into the permafrost and exposed the carbon, microbes converted 60% of the carbon into carbon dioxide in two weeks time. This immense release would likely feed on itself, raising temperatures that continue melting more and more permafrost in a vicious, frightening, and unstoppable cycle. A tipping point could well be crossed, at which time human intervention is no longer possible. Temperatures across the planet could soar, setting in motion catastrophic levels of drought and food shortage. All life support systems on earth and life forms themselves could be placed under severe stress. The colossal scale of the danger - and the observation of those factors lining up that could trigger it - demand that humanity exercise the precautionary principle. All political decision-making related to carbon emissions must be based on the understanding that a catastrophic consequence is looming, and the window of time for prevention quickly diminishing. 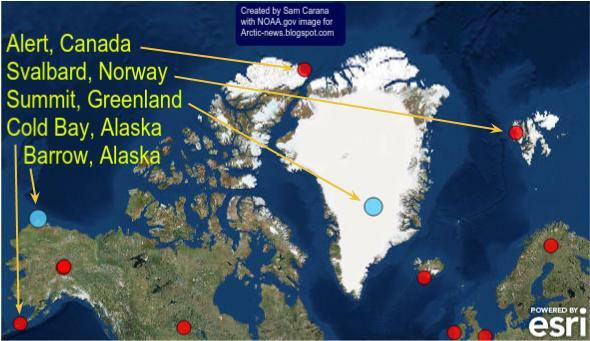 Can Thawing Permafrost Cause Runaway Global Heating? 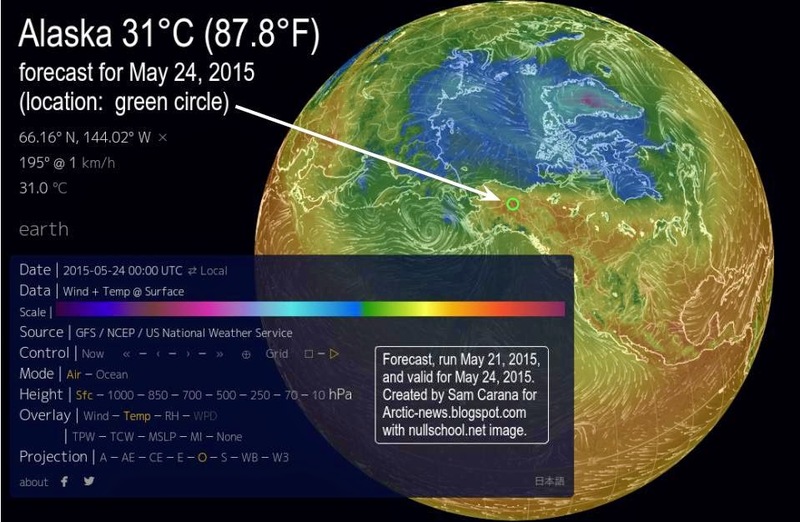 On May 12, 2015, a temperature of 80.1°F (or 26.7°C) was recorded in the north of Canada, at a location just north of latitude 63°N. The image below shows increased sea surface temperature anomalies in the area of the Beaufort Sea where the Mackenzie River is flowing into the Arctic Ocean. The image below further illustrates the situation, with sea ice thickness (in m) down to zero where the Mackenzie River flows into the Arctic Ocean. Things look set to get worse. The forecast for May 16, 2015, shows high temperatures extending all the way to the coast where the Mackenzie River flows into the Arctic Ocean. 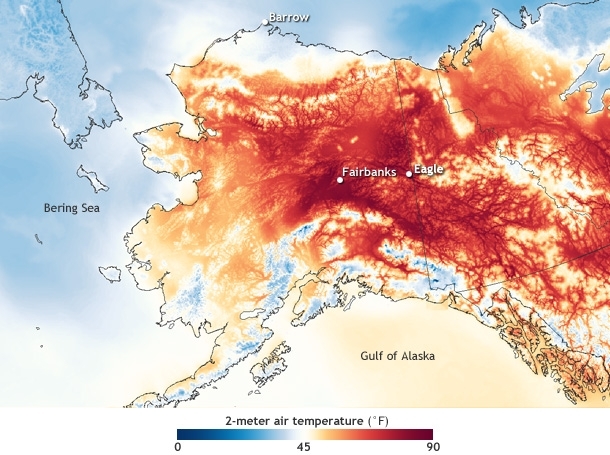 Alaska is hit by high temperatures as well. The image below shows temperatures as high as 25.3°C (77.54°F) at a location just north of latitude 66°N in Alaska. 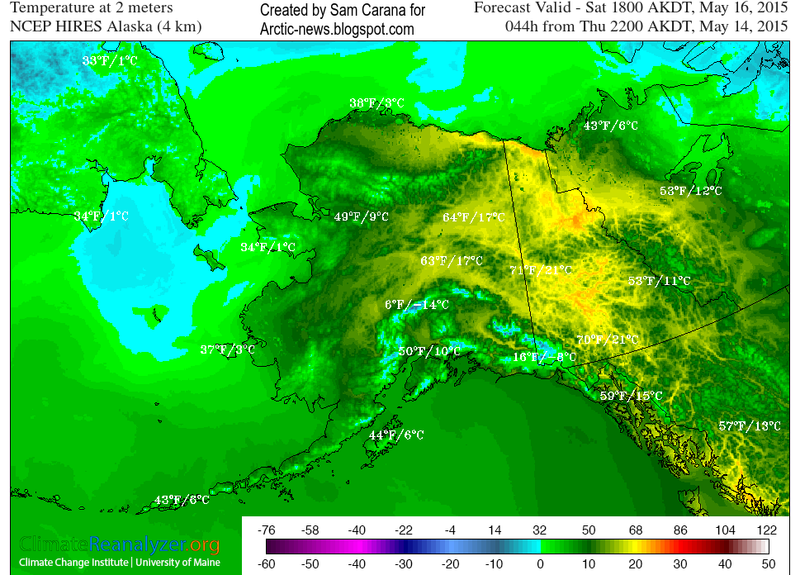 Below a forecast for May 23, 2015, showing temperatures in Alaska and neighboring parts of Canada that are 36°F (20°C) higher than they used to be (1979-2000 baseline). The image below shows that temperatures as high as 30.2°C (86.36°F) are forecast for Alaska for May 23, 2015, along the path of the Yukon River, at a latitude of ~66 degrees North (65.98°N). 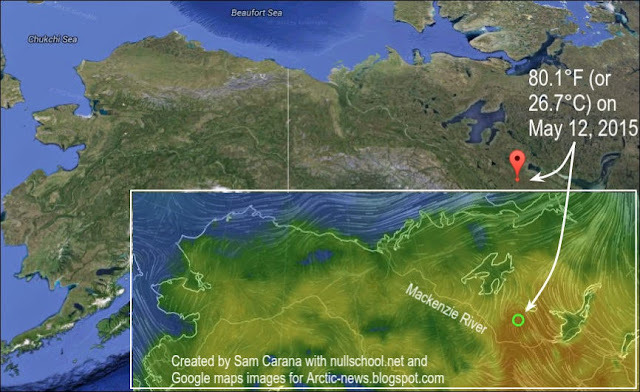 Furthermore, temperatures as high as 24.2°C (75.56°F) are forecast for the coast, close to where the Mackenzie River flows into the Arctic Ocean. Off the coast, over the water of the Arctic Ocean, temperatures as high as 8°C (46.4°F) are forecast, for a location just north of latitude 70°N, while temperatures as high as 15°C (59°F) are forecast for a location over the water of the Arctic Ocean closer to land. 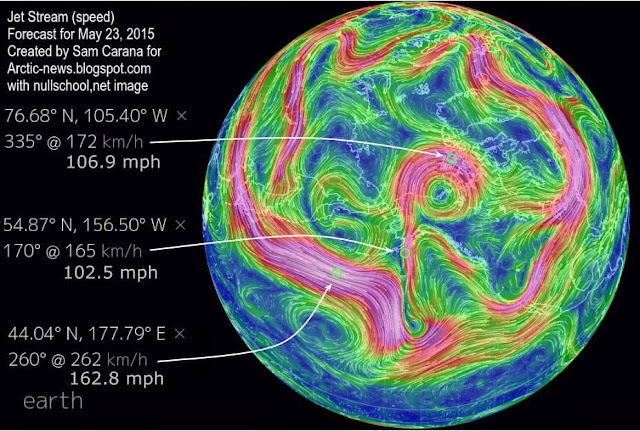 As the image below illustrates, the jet stream is forecast to move across Alaska on May 23, 2015, bringing warm air into the atmosphere over the Arctic Ocean. 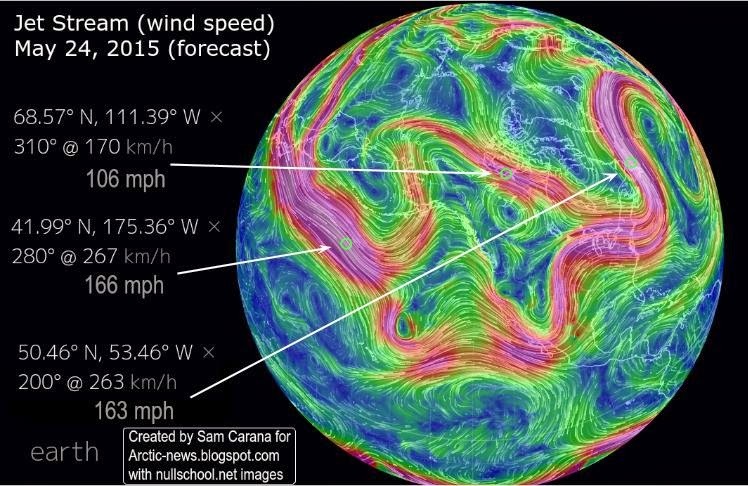 The image gives the jet stream's speed at three locations, i.e. 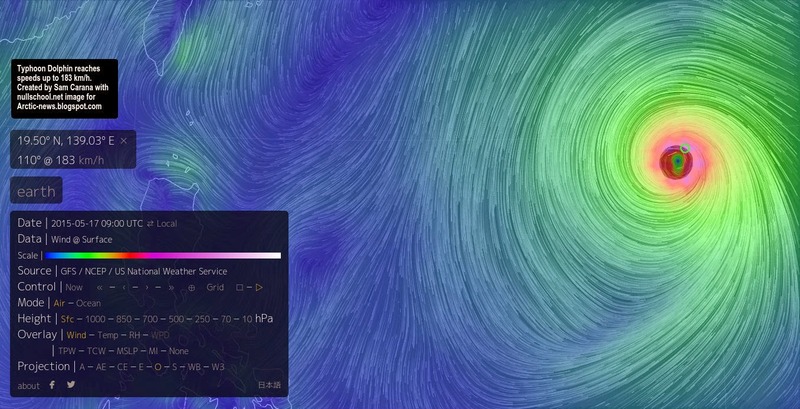 the jet stream is forecast to reach speeds as high as 262 km/h (162.8 mph, bottom green circle) over the Pacific Ocean, 165 km/h (102.5 mph, middle green circle) south of Alaska, and 172 km/h (106.9 mph, top green circle) over the Arctic Ocean. Looking at salinity is a way to see the impact of rivers. The animation below, created with Naval Research Laboratory images over the period May 16 to 20, 2015 (run on May 18, 2015), shows salinity levels falling where the Mackenzie River flows into the Arctic Ocean. Salinity works in several ways. 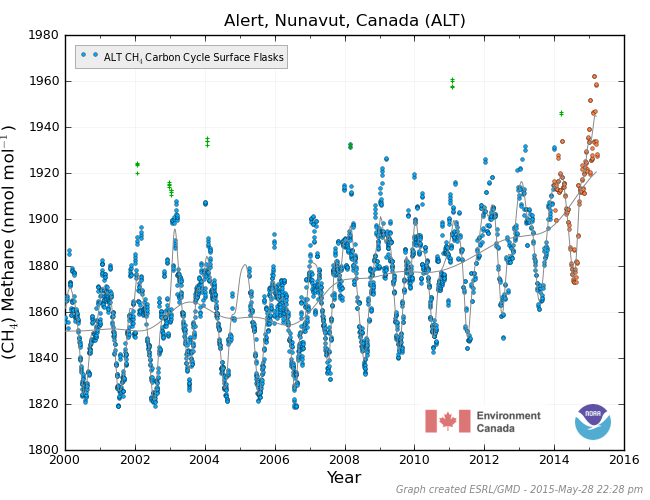 Falling salinity will increase the temperature at which the sea ice melts. 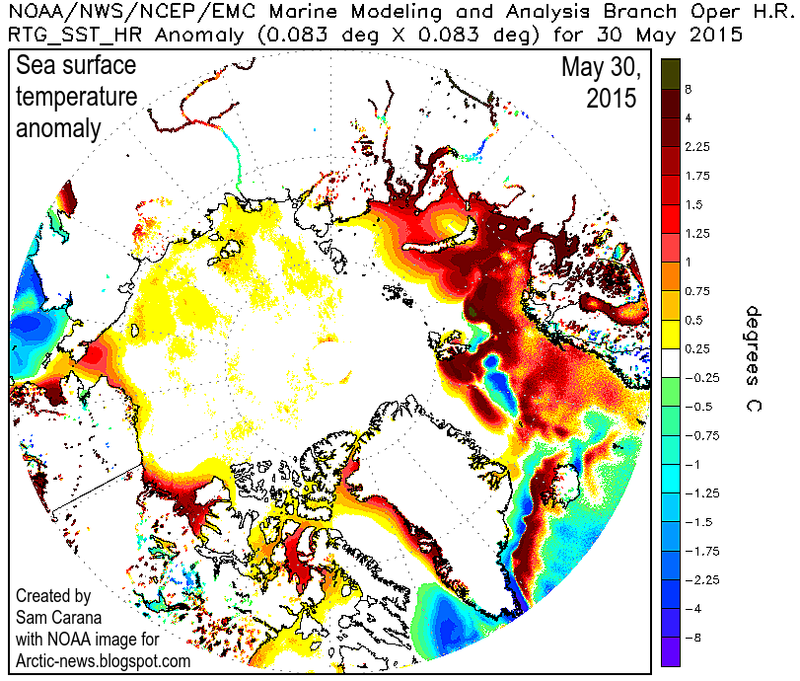 However, such an increase can only temporarily hold back melting, as illustrated by the combination image below, comparing sea ice thickness between May 7 and May 18, 2015. Let's have a look at some of the feedbacks that haven't been discussed much in earlier posts. 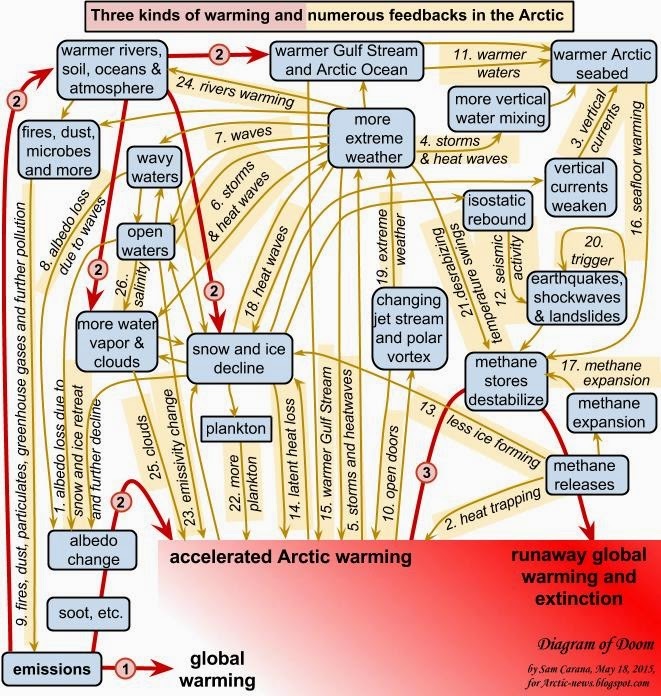 The potential for rivers to contribute to sea ice decline is depicted in the diagram below (feedback #24), i.e. 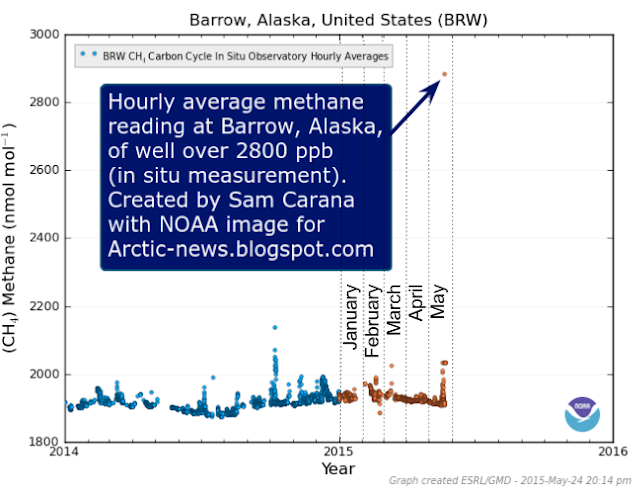 extreme weather causing warming of rivers that flow into the Arctic Ocean. 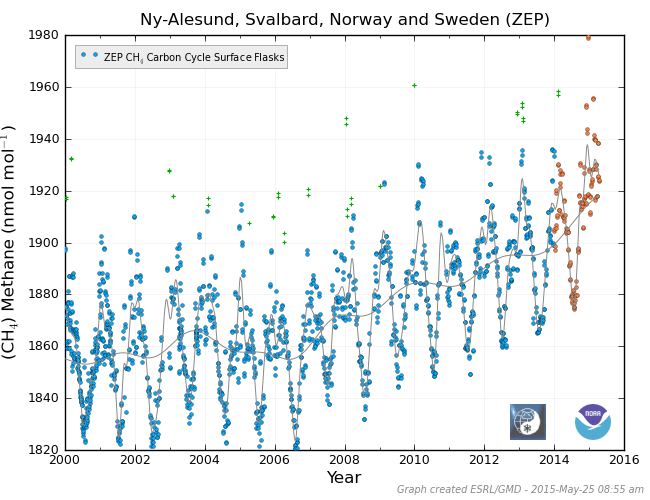 Furthermore, evaporation rates are higher over fresh water surfaces than over saline water surfaces (feedback #26) and the resulting increase in water vapor and clouds contributes to further warming (feedback #25), while rain falling on the sea ice will also cause its albedo to decline. The latter feedback also closes some loops. in that sea ice retreat results in more open water, in turn resulting in more water vapor and clouds. Another feedback is that, as more sea ice turns into open water, less infrared radiation will be emitted and sent out into space, since open oceans are less efficient than sea ice when it comes to emitting in the far-infrared region of the spectrum (feedback #23). 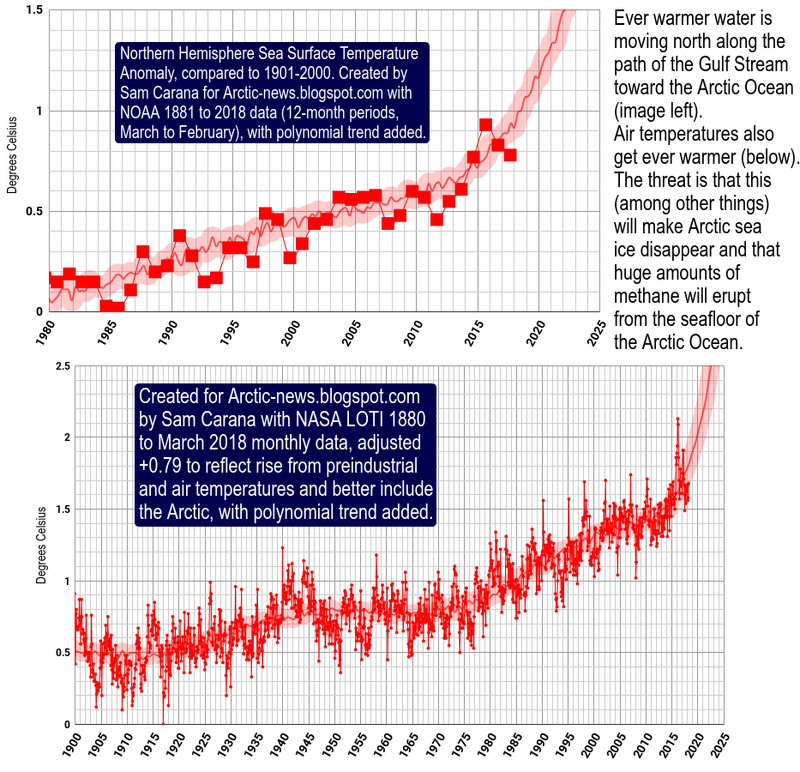 Furthermore, as sea ice declines, the increase in Arctic phytoplankton warms the ocean surface layer through direct biological heating (feedback #22). For more discussion of these feedbacks, see the feedbacks page. In conclusion, the situation is dire and calls for comprehensive and effective action, as discussed at the Climate Plan page. For the first time since modern records began, monthly mean carbon dioxide levels were above 400 parts per million (ppm), as illustrated by the NOAA image below. 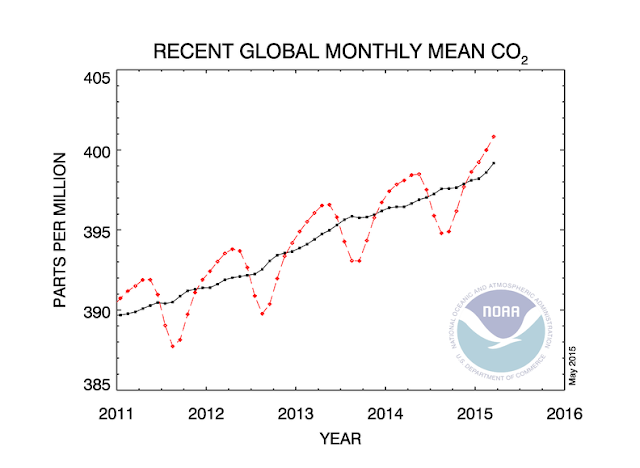 NOAA just released the mean global carbon dioxide level for March 2015, which was 400.83 ppm. Carbon dioxide concentrations can be especially high, i.e. 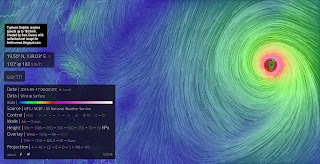 well over 410 ppm, at higher latitudes of the Northern Hemisphere, as illustrated by the NOAA image below. This can contribute to very high temperature anomalies over the Arctic Ocean and thus increase the risk of huge amounts of methane erupting from the Arctic Ocean seafloor. 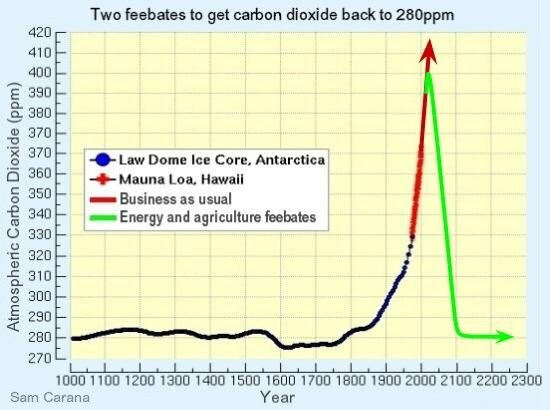 Since the start of the Industrial Revolution, carbon dioxide levels have risen non-linearly, as illustrated by the image below. 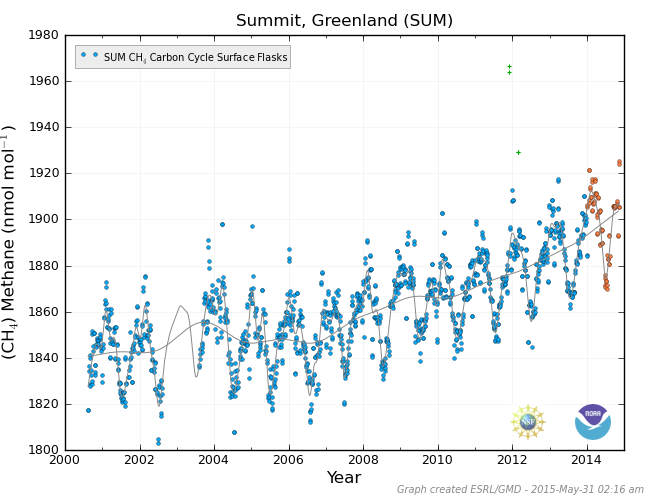 As many posts at this blog have warned, emissions by people and the numerous feedbacks are threatening to push Earth into runaway global warming. 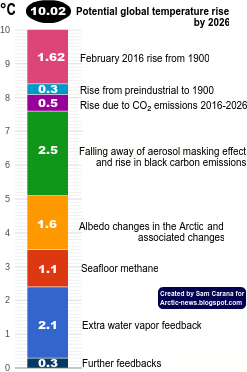 This calls for comprehensive and effective action to - among other things - reduce atmospheric carbon dioxide levels back to 280 ppm, as illustrated by the image below and as further discussed at the policies proposed as part of the Climate Plan. How best to get back to 280 ppm? The Climate Plan calls for restoration of greenhouse gas levels in oceans and atmosphere to their long term average by 2100. In the Climate Plan, multiple lines of action are proposed to work simultaneously, in parallel and separately in their implementation, yet complementary in their impact. One line of action is to cut emissions by 80% by the year 2020. To achieve this, the Climate Plan advocates implementation of local feebates. Especially important are fees on sales of fuel, while the resulting revenues are best used to fund rebates on products sold locally that further help speed up the shift to clean energy. Without further action, much of the carbon dioxide that has been emitted will stay in the atmosphere for hundreds, if not thousands of years. Therefore, further lines of action are needed, including removal of carbon dioxide from the atmosphere and oceans, with the carbon being safely stored. 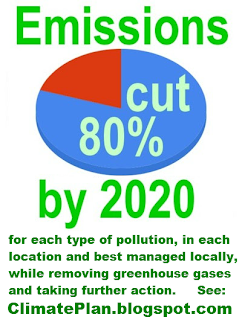 For the long term average of 280 ppm to be achieved in 2100, large amounts of atmospheric carbon dioxide must also be removed and safely stored annually. How much must be removed? 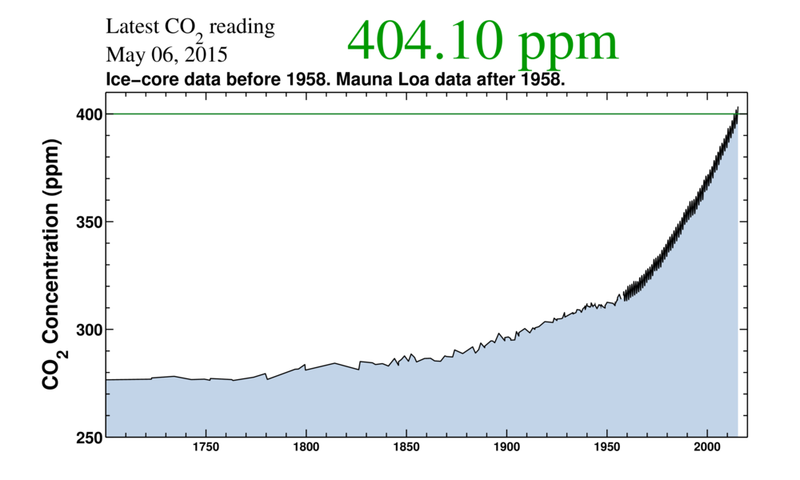 The period from 2015 to 2100 has 85 years, so bringing down carbon dioxide from 400 ppm to 280 ppm over that period works out to an annual removal of 1.41 ppm. 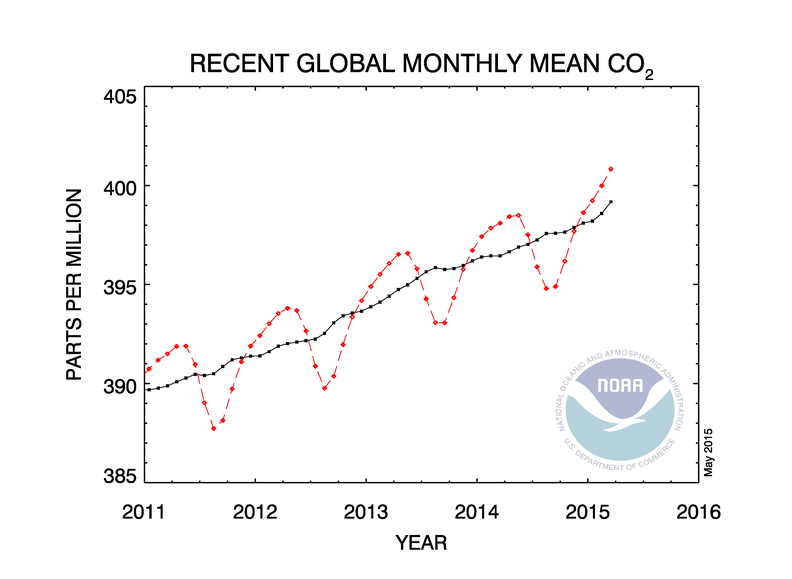 By comparison, this is slightly less than the annual growth in carbon dioxide levels as caused by people since 1959, which is on average 1.47 ppm. Assuming that emissions will not be cut quickly enough to avoid further build up of carbon dioxide in the atmosphere in the near future, annual removal will need to be somewhat more, so 1.47 ppm looks like a good target for now, precisely because it equals past emissions. The Climate Plan thus proposes that each nation will contribute to the necessary annual 1.47 ppm removal with a share that reflects its past emissions. 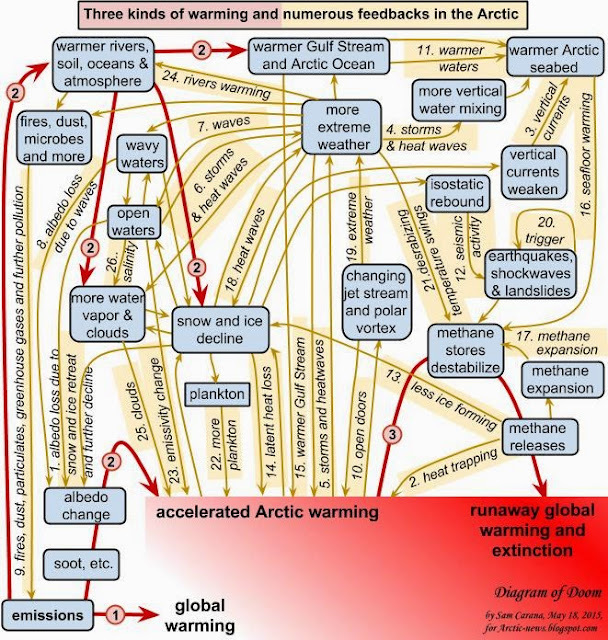 The image below gives an idea of past emissions. 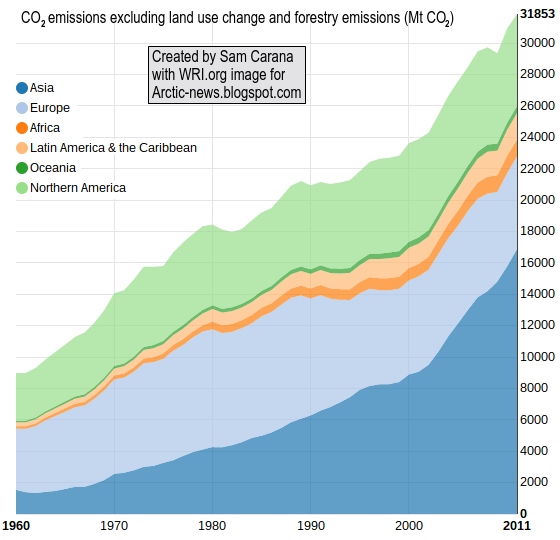 Note that the image only shows emissions up to the year 2011 and that they exclude land use change and forestry emissions. 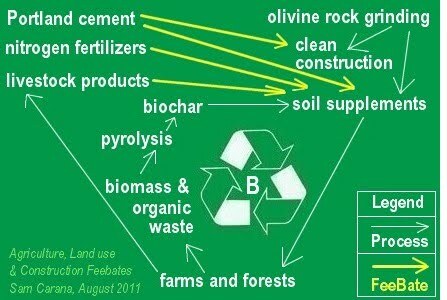 Furthermore, the image shows emissions based on where products were produced. Much of the rise in emissions is the result of products that were produced in Asia, yet many of these products were consumed in Europe and North America. Therefore, graphs based on emissions where products were consumed would paint a somewhat different picture. The Climate Plan proposes that a nation's contributions to carbon dioxide removal (from oceans and atmosphere) will reflect its past emissions based on where products were consumed. The Climate Plan advocates separate lines of action, i.e. 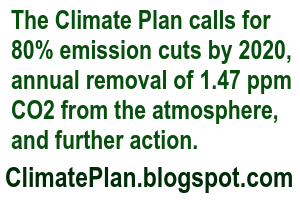 greenhouse gas removal next to emission cuts and further action. Keeping action on different types of pollution separate and calling for local action in each nation further helps avoid that progress elsewhere is pointed at by a nation as an excuse to delay the necessary action on a specific type of pollution in that nation. As said, the Climate Plan therefore calls for fees to be added on sales of polluting products where they are consumed (as opposed to where they are produced). Each nation is further expected to take steps to contribute its share to the 1.47 ppm carbon dioxide that needs to be removed from the atmosphere annually. Additionally, carbon dioxide needs to be removed from the oceans. The most important thing each nation can do in the lead-up to the upcoming U.N. climate conference in Paris is to accept these commitments. How each nation and local community does achieve targets is best decided locally, provided that each nation and each local community does indeed reach its targets, and this follows from this commitment. One reason why local feebates are recommended is that they can focus on achieving local targets for a specific pollutant. Local feebates allow communities to quickly adjust the height of the fees, where a local community threatens to fail reaching a target. Such a local focus does not preclude action being beneficial elsewhere as well. Indeed, the same feebate can work for multiple pollutants and on multiple lines of action. In this sense, locally implemented feebates often work complementary. As an example, the feebates pictured below will help remove carbon dioxide from the atmosphere and oceans, while they will also help cut emissions of carbon dioxide, methane, soot and nitrous oxide.